Very Very Vicky: Cottage Style Magazine--Here We Come! Cottage Style Magazine--Here We Come! I've got some exciting news! I've known for a while but I've kept my secret "in the vault" just in case it should prove too good to be true. But now I think it is safe to share. 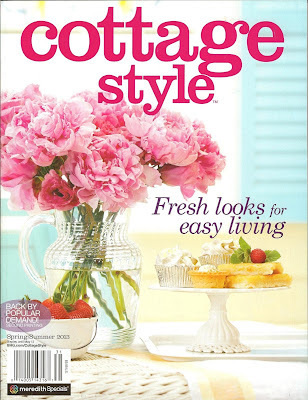 The Coral Cottage is going to be featured in Cottage Style magazine! from this post. Nancy is a freelance writer who is a frequent contributor to Cottage Style magazine. When I was setting up housekeeping at The Coral Cottage before Christmas, she came by to see the house and ended up helping out! Nancy lives in Colorado and this fall she was attending a writer's conference at Tybee Island. While she was in town, she was looking for some cottages that might be candidates for future writing projects--so glad she found The Coral Cottage! Nancy loved the cottage--even in its unfinished condition--and gave pictures to her editor who gave the go ahead to write the feature. On Tuesday Cottage Style will send a professional photographer and a stylist to do a photo shoot at the Coral Cottage! Can't wait. So excited. I'll tell you all about it next week! I KNEW IT!! I just felt something wonderful was going to happen to this sweet cottage you and Jane Coslick transformed. I am so happy for you. There were so many great ideas you guys came up with & I am so glad you decided to share them. I will be looking forward to seeing it in Cottage Style. Awwww...thank you Janet. You are such an encourager! I can't wait to see! So proud of you! Something For My Favorite Peeps! It Takes a Lot To Move a House! A Special Day--Are You Curious? The Beach Cottage We Bought For A Dollar! Cottage Style Meets Coral Cottage!